New Delhi (Sputnik): Vrindavan, one of the oldest cities in northern India, has turned into a riot of hues as revellers from far and near have gathered to celebrate Holi — the festival of colours. Though the festival is observed across the length and breadth of India, Virandavan is considered the epicentre of the celebrations, as the festival's origin dates back to the times of Lord Krishna, who is said to have spent his childhood in Vrindavan. Vrindavan, which is about 180 kilometres away from the Indian capital New Delhi, means "forest of holy basil", as virnda means basil and van means forest in Sanskrit, the ancient language of the subcontinent. Visiting Vrindavan at this time of the year means treating yourself to the sight of roads drenched in different hues of spring — magenta, red, yellow, blue and green — all leading to the ancient Banke Bihari Temple, dedicated to Lord Krishna. Thousands of people march towards the temple, smearing each other with colourful powder and tinted water. 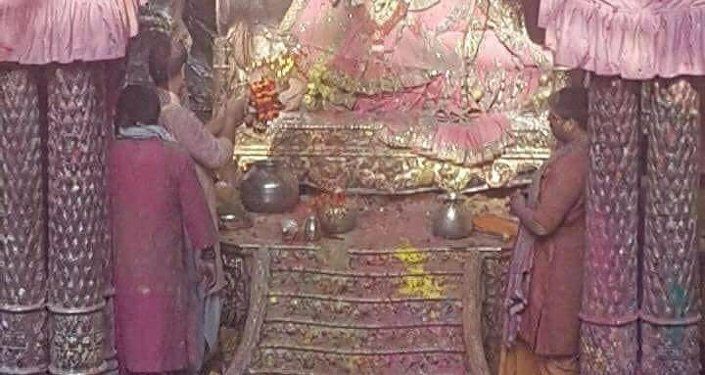 They gather at the temple and smear the deity with more colour and toy cannons, locally called "pichkari", that shoot jets of coloured water. The day of Holi falls on the full Moon day of March. But celebrations in Vrindavan start a week earlier. This year, the concluding day of Holi falls on 21 March. This day also marks the victory of virtue over vices, as there is no discrimination between the rich and the poor and between the fair and the dark. All faces are painted in similar colours, and it becomes hard to recognise one person from the other. "Holi is most celebrated festival here in Vrindavan, it was started by Lord Krishna about 5,000 years ago and people still continue to celebrate the festival with the same passion. 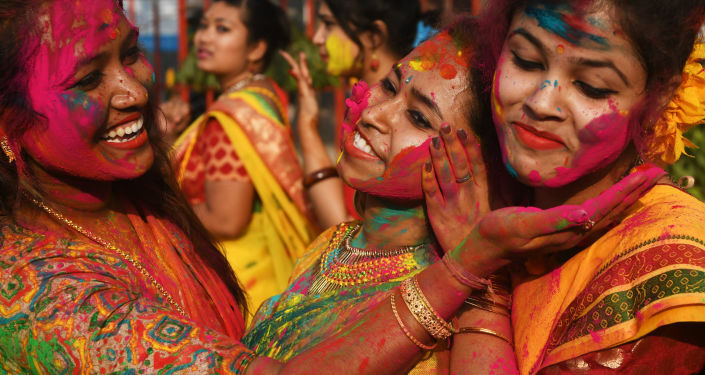 Primarily, Holi started with the people of two towns — Vrindavan — where Krishna spent his childhood and Barsana — where Radha (his soul mate) was born", Prabhupad Acharya Gyanendra Kishore Goswami, the head priest of the Banke Bihari Temple told Sputnik. Goswami's ancestors have been witnessing this festival for the past many centuries as they are the priests of the ancient Banke Bihari Temple of Vrindavan. However, there is also another side of Vrindavan. It is also known as the "city of widows", as it is the abode of widows from across the country who, in order to escape social ortracisation, take refuge in the temples of Vrindavan and elsewhere. The total population of Vrindavan is about 63,000, of which about 20,000 are widows. In most parts of India, women whose husbands die are often abandoned by their families, forcing them to fall into a mire of indignity and beggary. These widows were the only people in India who were not part of Holi frenzy until 2012, when after seeking directives from the Supreme Court, an NGO named Sulabh International, decided to step in and organize Holi celebrations for the widows in Odisha's Gopinath Temple. Thousands of widows dipped their hands in the colours of Holi and took the first step towards liberation from unfounded social stigma. This prompted a number of litigations in favour of the liberation of widows, following which, in August 2017, the Supreme Court of India directed the Indian government and the Uttar Pradesh administration to take adequate steps to restore the dignity of the widows of Vrindavan. Likewise, a committee was formed to look into the plethora of problems and stigma faced by widows and to find ways to rehabilitate the widows of Vrindavan. The court has suggested the committee look into the possibility of encouraging remarriage for the widows. "This is a subject of hope that might enable our society to give up the stereotype view of widows. We request the committee to consider this during deliberations", a bench of Justices Madan B. Lokur and Deepak Gupta observed in a recent judgement. Meanwhile, this year, the widows of Vrindavan, as well as the Gopinath Temple, have decided not to celebrate Holi to mourn the recent death of former Defence Minister Manohar Parrikar. "This year, widows pay tribute to departed soul of Goa chief minister, Manohar Parrikar, we are not celebrating Holi", Bindeshwar Pathak, founder of Sulabh International said. Nevertheless, traders say they are very happy as they have done more business than ever this year on Holi. A trader told Sputnik that the demand for Holi colours and related items is high this year, as people are doubly excited due to the upcoming general elections. "After long, traders are very happy and expecting good profit. Just few days back, the response was very slow but after elections were announced, demand has picked up. We are expecting that traders will be able to clear their stocks this year after long", Dev Raj Baweja, general secretary, Confederation of All India Traders, told Sputnik. On the political front, leaders of all major parties, including the governing Bhartiya Janata Party and the opposition Congress party, are making efforts to woo voters by joining the general public in Holi revelry. Water guns bearing the pictures of Prime Minister Narendra Modi and Congress' new face Priyanka Gandhi have flooded the market. "My daughter wants Priyanka and son wants Modi Pichkari (water gun) this Holi. Earlier, they were buying those with cartoon characters. 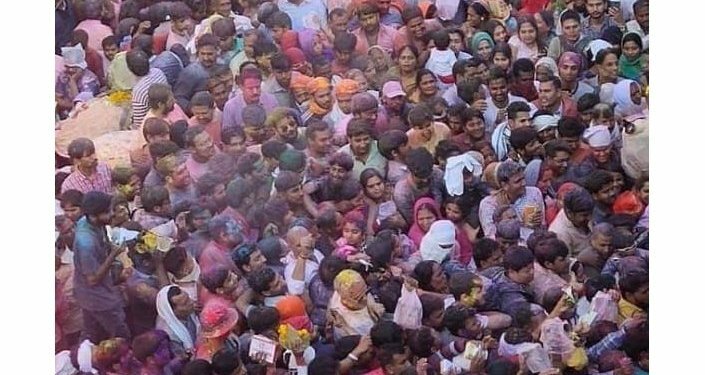 Elections have added a different flavour to Holi this year", Om Prakash, father of two kids, who was buying water guns at Jhandewalan toy market in central Delhi, told Sputnik. The Holi festival is also marked to welcome the arrival of the spring festival. This year, the Holi festival coincides with the beginning of general elections, which are due in a month's time in India and the political parties are not letting any colour be left in their store to attract the voters while playing Holi with them. The views and opinions expressed in this article are those of the speakers and do not necessarily reflect the official position of Sputnik.